You are traders in the bustling commerce city of Carthage, buying goods at Market and selling them to overseas merchants. But if you want to prosper, be careful of pirates! Players buy goods or grab coins in the market while cards in the farm replenish the market. When goods are bought, ships move toward Carthage. When a ship reaches Carthage, a payday occurs, where that particular merchandise is sold. Any ships on pirate spaces get raided and you must discard cards with storage icons to try and save your merchandise. Achievement tokens increase the value of your merchandise and when someone has gotten 8 or more such tokens the game is over. 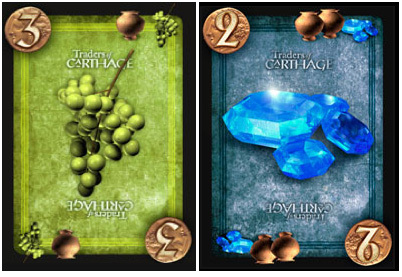 You play as merchants buying and selling goods between Alexandria and Carthage. The artwork on the cards and the board are very nicely done and suit the theme very well, the quality of all the pieces are very good given the reasonable price tag. Setup involves dealing out cards to each player until they each have at least 8 coins worth of cards (The cards are marked in the corner with various values of coin). Each player also takes an Achievement Token of their choice. Then the player with the least total value of cards becomes the first player. One half of the game board shows a map of the area depicting several ports between the main cities which ships have to travel via, the other half hold the cards, discard pile and has a places marked for Farm and Market. The rules are short but did prove a little confusing until we actually played a few rounds, finding that we were playing certain rules wrong . Once we got the hang of how to play it turns out this is a real gem of a game and I really like how it plays. The cards represent everything in the game, from Goods, Coins, VP’s to Storage. This is what confused us for a while but actually works very nicely. You have to buy all the cards in the market (including your reserved card if you have one), except cards reserved by other players. To do this you spend cards from your hand to the same or greater value to total value of the goods in the market. These are then placed in front of you face up as your goods. When you buy from the market the ships advance towards Carthage One square if you have only a single good of the corresponding colour or a maximum of 2 squares if you have 2 or more goods of the same colour. You can take your reserved card OR any one unreserved card into your hand as coin. You can place your reserve token on any card not already reserved in either the Farm or Market. If someone buys the market or you start your turn with only cards reserved by other players in the market it is first refilled from the farm, 2 cards added and then 3 cards are placed back in the farm. When a ship or ships enters Carthage there is a payday on goods the same colour as the ship. You look at all the goods you have of that colour, take the highest valued card and times it by the number of cards rounded up to the nearest 5 or 10. These are your VP’s starting with the lowest value good you place one card face down for every 5 VP’s you have, if you do not have enough good cards to convert to VP you take them from the draw pile. You also collect an Achievement Token for that colour good. Achievement tokens add 1 point to the highest value card when calculating your VP’s. Then ships then return to Alexandria. When a payday occurs and there are ships on one or both of the pirate squares gods of the corresponding colour are raided by pirates. To protect your goods you discard cards from your hand with matching colour and storage icons marked on it. For each storage icon you have you may store one good card (tapped 90 degrees). If you have no storage cards then you lose ALL of the goods of that colour. The ships then return to Cyrenaica. The game ends when one person has collected 8 Achievement Tokens, the winner being the person with the most VPs ties resolved using the number of Achievement Tokens. This game is fun, plays quite fast (once you get the hang of it) and is a pleasure to play. I think this would be a worthy addition to anyone’s collection. 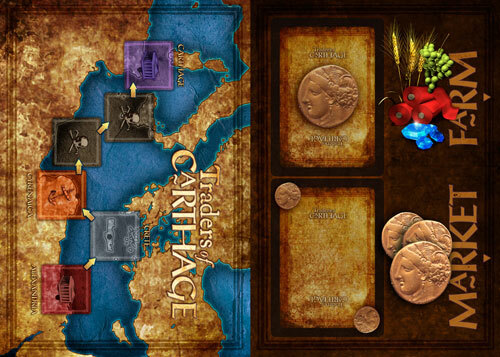 Add a Review for "Traders of Carthage"